It is a critical time in California water policy. At the end of 2009, a series of water-related bills was passed by the California Legislature, with the intent of moving the state out of decades of gridlock over water resource management. Simultaneously, the Legislature approved an $11.14 billion bond called the “Safe, Clean, and Reliable Drinking Water Supply Act of 2010” to fund water system upgrades. This is the largest water bond in 50 years, yet the costs and benefits of the bond have not been fully assessed by an independent organization. The water bond has been postponed to 2012, but actions must be taken by the Legislator to ensure a responsible and effective water bond is proposed two years from now. What does the bond language actually cover and say? How does the bond compare to past water bonds in size, definitions, and scope? How will the bond be allocated among different funding priorities? What are the governance implications of the bond? What options are available for funding water system improvements? What effect would the bond have on other critical public services and projects funded by the state? How are the water needs of disadvantaged communities addressed by the bond? 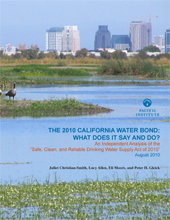 The full report of our independent analysis of the 2010 Water Bond is available, as well as three NEED TO KNOW Information Sheets. – What are the Fiscal Impacts of an $11 Billion Water Bond? – How Does this 2010 Water Bond Compare to Past Bonds? – Does the 2010 Water Bond Help Those Who Need It Most? Download the Water Bond Overview PowerPoint presentation. PowerPoint photos courtesy of California Department of Water Resources, Salton Sea Authority, and the City of Idaho Falls. Download the Water Bond press release.